Destination PC by Gateway 2000 is a 120 MHz PC manufactured to serve groups of users instead of a single user. It comes packed with a Mitsubishi 31-inch monitor, TV Tuner, wireless keyboard and mouse, a six-speed CD-ROM drive, 28.8 kilobit/sec modem, 16M of RAM and 1.2G Hard Disk Drive. Destination uses two wireless input devices that use radio frequencies rather than infrared technology, the former providing better range and omni-directionality. The keyboard is a standard PC keyboard with a touchpad pointing device built in. Destination has high-fidelity audio built into the computer, but for better sound gateway has a deal with the renowned home-and-commercial audio company Harman Kardon to provide an optional surround-sound system. It is one of the greatest gadgets I’ve ever owned. It captured full color still images from a composite video input in a variety of resolutions and interfaced to a PC via a parallel port connection. It is very simple to operate. Just plug the stylish Snappy hardware module into your PC or laptop parallel port. Then connect any camcorder, VCR or TV with the included cable. Watch your PC screen, and when you see a picture you want, click SNAP. Play Inc. won a Popular Mechanics Design & Engineering Award for this awesome gadget which made it very easy to put video image into your PC. Snappy 2.0 supports arbitrary image resizing, image cropping and new picture-taking modes that emulate a 35mm camera. Nintendo 64 was not the leading in any technical categories, but some of the best video games saw a rise in their popularity. Games like Super Mario 64, Mario Kart, GoldenEye 007, and the Legend of Zelda were a part of many of us childhood. While launching this, Nintendo moved ahead of 32-bit consoles of Sony and Sega in the race of video games. Nintendo 64 was the technologically advanced system that started with the 5th Generation Gaming Era by using the 64-bit central processor. Super Mario till date is the most revolutionary 3D game of all the time. Casio launched their Personal Digital Assistants under the brand name of Cassiopeia. It used the Windows CE as Operating System. Palm had already locked the market of PDAs with their products. But Cassiopeia E-10 did receive a lot of love and attention mostly for its Windows 95-based UI and porting over pocket versions of Word and Excel. It had a great speak and sound quality. The addition of compact flash slot made it preferable as it opened a lane to expand the memory. E-10 had 4MB of RAM, 240×320 4 grayscale backlit LCD, IrDA port, earphone jack, microphone, and flashing alarm LED. It drives it power from lithium button cell backup battery, and 2AAA batteries. Casio’s QV-10 was the first consumer-grade digital camera with LCD at the back of it for previewing and viewing images. It was awarded the status of “Essential Historical Material for Science and Technology” by Japan’s National Museum of Nature and Science. This invention could be recognized as the one contributing for rise in popularity in Digital Photography. Though other digital cameras were launched before that but it was a package of unique and new features like capturing images digitally, display then on LCD screen, store the images in the internal memory and connectivity with the computer for transfer of media files. One other unique and unusual feature is that the body is split, so the lens portion could be rotated around to click a selfie. So, basically this Digi-cam brought selfie in the trend. It was the first kind of Scientific calculator which could draw graphs for the quadratic functions you enter. Not just that it could even do some equations for you. Well, it is not all that made it cool. One more feature that added it to the preference list of the consumers is that it also had games like Tetris and Falldown. Hence, one gadget which does calculations for you and is also a source of entertainment in between your hectic schedules. It was a great help for the high school students for storing the formulas difficult to learn to let them cheat in exams. 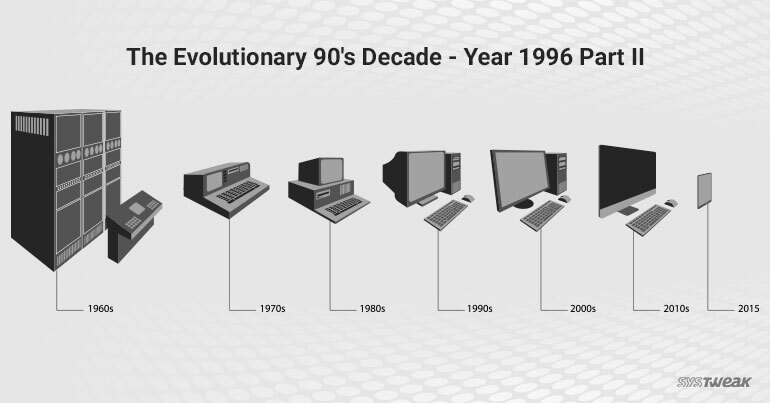 The Revolutionary Interactive Pager 900 was one of the earliest pager models by Research In Motion, launched in 1996. Rim waited for email service to become business critical enough while working on making its hardware smaller, sexier, and completely indispensable to anyone who picked it up. It was specialized in two-way messaging and had limited HTML access, though it was e-mail capable. The exchange of messages through text or emails over the internet via a wireless data network known as Mobitex. The new things wireless users were introduced are peer-to-peer Delivery and Read Receipts and sending faxes and text to speech messages to a telephone. Though the company did not do away with traditional features like one way paging system, interactive voice response etc. With this we come to the end of the list of the best gadgets of the year 1996. In the next blog, we will take a look at the best gadgets of 1997. Subscribe to our newsletter to receive the next blog directly in your inbox.